soon usa and britain will be dust 1 chinese nuke and all there mothers will be leveled china is going to nuke them all china is going to nuke ireland australia and norway also soon all europeans will learn what real power is 1 blow to the head and its game over all there mothers graves will burn to ashes. Stop being so juvenile. Silly person. Operations of United States Air Force (USAF) Electronic Intelligence (ELINT) and Signal Intelligence (SIGINT) platforms would have sent even stronger message to the Chinese as they are valuable assets even in peacetime. It s deliberate provocation of the Chinese. There was not a bit of training involved. 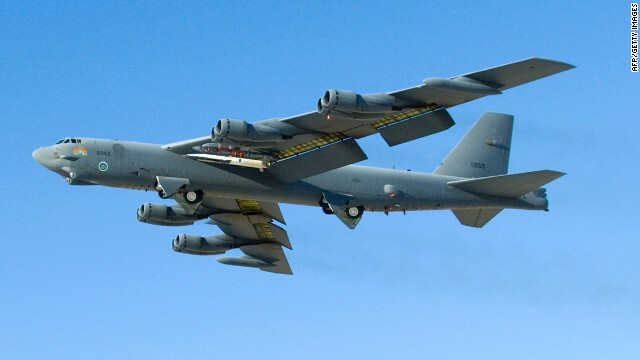 lets hear it for the B-52, nearly 60 years old an still the backbone of the air force! Incredible. The fact that they are over 60 years old should tell us all something about US progress in this area – not that good. Sure hope they keep buying our bonds!!!! China changes the rules on this issue. Thank you, Nash. Unfortunately, a war with China won't do any of us any good since both countries now possess nuclear weapons. Now you can see why getting rid of nuclear weapons is not such a bright idea after all. It'll lead only to another world war and who in their right mind wants that? One thing we could do to improve relations is to bring more Chinese students over here, make sure that they enroll in mathematics, physics, and engineering courses, and to give them scholarships in doing so, and to hell with American students who try to do the same in their own country! American students to China? We don't allow American students to study here anymore. Only the well off get the privilege today, and all the rich foreign students who can pay 150% or more of tuition. We have ruined health care here, now let's finish destroying our educational system! Chinese students are typically better in math and physics, so what do you expect? The B-52's flew along the eastern edge of the zone for more than 2 hrs, never got close than 200km from the disputed islands. Is this a stunt or I was wrong? Remember reality check, it's these kind of insane stunts that helped to start and then fuel WW1. Does anyone here think that WW1 was a good idea? I don't and neither is this fool stunt pulled by those idiots in Washington and anyone here who does needs to have their head examined!!! I want my TAX to spend on me. Not on ACA, Not on illegal immigrant, Not on someone else business. Lower the TAX for middle class. Just pay your taxes and stop complaining. last time I checked...we barrowed billions from China...so who the boss now? .this is nothing but posturing by china....china attempts to test the US asia pivot...Until US reacts and pushes back.. ..the People's Liberation Army is NO match to the US navy....they will back down.. Where would their economy be if they could not dump their sweat shop manufactured consumer products in US markets. Don't forget rkfrom ny, that if the Chinese stop financing our huge deficit, the right-wing politicians in Washington will gut Medicare, Medicaid and Social Security in order to make up the difference! Then schools and libraries will close, our infrastructure will deteriorate further and police and firemen will be laid off! Just who in their right mind wants that, rkfrom ny? Get real. You know china needs our money so they can act like they are the big stuff. If we quit shipping in their products they would go back to the dark ages. Mmmmmmmmm The pentagon must not shop at Wal-Mart. Keep it up all you wingers untll China stops shipping to us. Then we will see! Go ahead, China, Stop shipping your goods. We'll see who's the bigger bully! I'd rather stick to the one with democratic principles. I believe this is like the hanky smack of a challenge!!! Everything you just said is factual, NOT! First don not hide behind an anonymous name, and second, LEAVE!!! I would like to know where you get all these false claims. I'm a Muslim and I stand with USA. The true evil is Iran. They are starving there people. They rather build bombs then open their borders for humanitarian help. The Arab League supports the USA in the Middle East. Morocco just opened a new dialogue with America. In Afghanistan the tribal leader are urging their president to sign a new pact with America for their protection. Vietnam asked America to come back so they can be protected from china. I could go on with countries asking America for protection. The right-wing thugs in Washington are again showing their utter contempt for international law just like the Germans and J apanese did in the late 1930's! It's heinous people like these who cause all these needless wars and bring on needless suffering to millions! This why we can't have peace! What international law? China just declared that this so called "zone" is off limits, it has nothing to do with international law. Lyndsie, go and live in China!!! I prefer to spend my tax dollars on infrastructure and benefits to Americans. Do not even come here as a tourist. International law? ?muhahahha-what r u talking about. Is chinese law international law now???? An insight from Amazon Kindle's new thriller, The Bahrain Protocol, foretold America's pivot away from the Middle East to confront China; read below. This "upcoming" war that you're talking about is one that will produce neither victors nor vanquished since there will be very few survivors. Those who do will eventually starve to death anyway. Even without nuclear weapons, China can still beat us if we're foolhardy enough to invade them like J apan did back in 1937. Many ignorant politicians seem to be that foolhardy and want the rest of us to be, too!!! china is no match for US military navy and air force or technology...!! Almost a year ago, china hacked all of the design files of our tech. AFAIK they got everything. They have already fielded stealth drones, I still hope China is just testing boundaries and not really willing to start a war over those islands. Really at this second we could take china, but they will be our equals in less than 5 years or so. Tell me Random, what makes you thin that we can succeed where the J apanese failed so miserably back in the 1930's and 40's? When they invaded China back in 1937, they too had vastly superior weapons like we do now. We Americans need to rid ourselves of both our ignorance and our superiority complex.